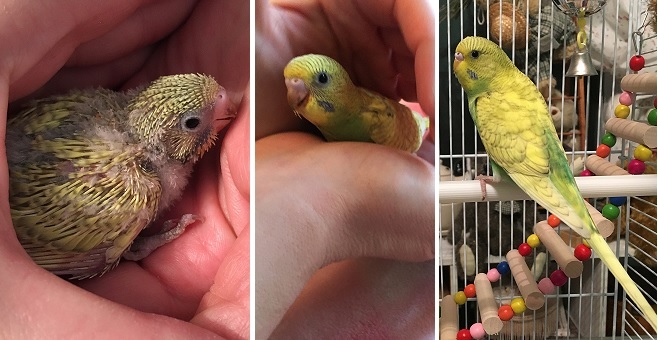 Quinn, one of two baby budgies that were supposed to come home with me after Christmas passed away on December 27th from a suspected crop and respiratory infection. She was 9 weeks old, and was a outgoing little bird, wiling to hop on my hand and run along my arm when I put it into the cage. I was really looking to bringing her home... she will be missed. I’m so sorry that little Quinn didn’t recover from her illness. She was a beautiful little bird and I know she’ll be missed. Now free from illness, flying high over Rainbow Bridge. I'm so sorry to hear of the loss of baby Quinn. She will surely be very missed, during her short time on earth I know she had the best possible care. Hugs to you and your family during this difficult time! I'm so very sorry for your loss of darling Baby Quinn. May she fly high and free at the Rainbow Bridge. I’m so sorry to hear about baby Quinn. May she Rest In Peace. I know it's been a few weeks since posting this, but thank-you everyone. I ended up putting Quinn in a little box, and burying her under some of the nice big trees in my parents yard. I left a little bird garden ornament so we would know where she is. It's a really nice spot, especially during the summer, when everything is growing and green. I am very,very sorry for your loss. RIP Quinn.